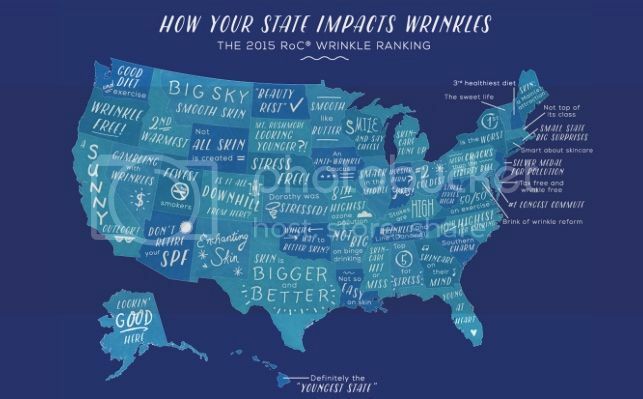 Pammy Blogs Beauty: The 2015 Wrinkle Ranking Study: How Does your State Rank? Plus, RoC® Skincare Giveaway! The 2015 Wrinkle Ranking Study: How Does your State Rank? Plus, RoC® Skincare Giveaway! The 2015 Wrinkle Ranking Stucy: How Does your State Rank? Location is everything when it comes to choosing the right neighborhood, apartment or family home, but did you know that the state you choose to live in could contribute to the development of wrinkles? 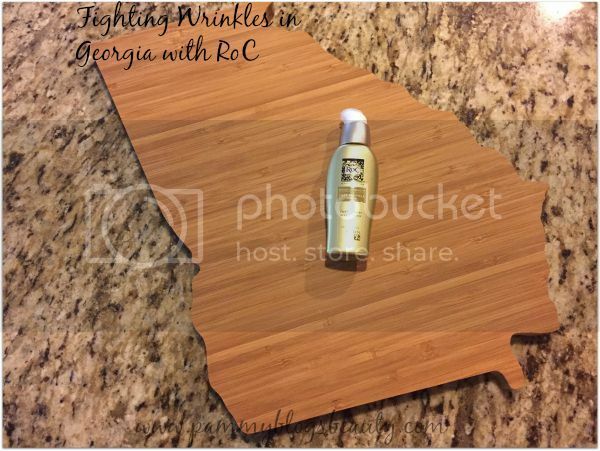 Recently, RoC® Skincare revealed the results of the 2015 Wrinkle Ranking study and Georgia (my home state) is #27! This is so interesting! In partnership with Sperling’s Best Places, Wrinkle Ranking helps Americans read between their fine lines and wrinkles by exposing the less obvious, state-specific factors that contribute to aging skin. So, why did Georgia have a median rank of #27? Looking at these results, I definitely find that they all are true for Georgia. The pollution and long commutes are certainly a contrast to other areas of the country. However, with Georgia's median rank, we certainly are not the worst. I am really happy to hear that there is a low rate of skin cancer. This is actually a bit of a surprise to me. However, that might just be because skin cancer has personally affected me since my Dad has it (Basal Cell Carcinomas that are removed practically monthly) and I have lost a dear friend to Melanoma. I certainly agree that the humidity does great things for your skin! Next time I am complaining about how humid it is and how it is frizzing my hair, lol, I will need to remember the benefits for my skin! Hey, I would rather deal with some humidity than having to deal with extremely dry air that leaves you feeling parched. The Second Annual Wrinkle Ranking Reveals the Underlying Factors That Contribute to Aging Skin. Curious about how your state ranks? Check out the results from the 2015 Wrinkle Ranking Study here. So, why is it important to hear about how your state ranks and what factors are identified per state? Well, using the Wrinkle Ranking findings can help you understand what might cause your skin to age. So, you can take steps to fight these state-specific factors that cause your skin to age. Finding the right skincare is key to this! You can adopt a good skincare routine with effective products to help eliminate or reduce your fine lines and wrinkles. As a RoC® Skincare Brand Ambassador, I am a huge fan of the line. RoC® Skincare is one of the best product lines available at the drugstore. The products are well formulated and very effective at fighting lines and wrinkles, preventing skin damage, and even reversing signs of aging. The brand was actually the first to stabilize and patent pure retinol in a cosmetic product. Plus, they have continued to research skincare and have partnered with dermatologists to improve formulas and create clinically effective products. If you are looking for high-quality and effective Retinol products at a drugstore price, look no further than RoC® Skincare! I highly recommend the brand and the products! Find out more about RoC®'s RETINOL CORREXION Deep Wrinkle Serum and MULTI CORREXION 5 in 1 Restoring Night Cream by clicking "read more" below. Plus, be sure to enter the Giveaway!!! Contains an exclusive combination of pure Retinol and an essential mineral complex that is clinically shown to visibly reduce even deep wrinkles. When you apply RoC®'s RETINOL CORREXION Deep Wrinkle Serum after cleansing and before moisurizing or applying makeup, the formula works to improve radiance of skin. With continued use, you will notice a visible reduction in both fine lines and deep wrinkles, expression lines are smoothed and signs of photo damage are diminished. Available at food, drug, and mass merchandisers. Retails for $22.99 for 1.0 oz. tube. In a clinical study, 100% of women saw improvement in the following areas after 16 weeks of treatment: skin radiance, skin texture, and fine lines. The Same study reported 91% of women saw improvement in under-eye wrinkles and 78% saw improvement in age spots after 16 weeks of treatment. Available at food, drug, and mass merchandisers nationwide. To enter, fill out the Rafflecopter form below. Please note rules on Rafflecopter form (Pammy Blogs Beauty not responsible for prizes lost in mail/shipping, prizes not redeemable for cash, giveaway for 18 years old and older, USA only, etc). I live in a non wrinkle prone state at Number 49- Washington State. This is good to know! Im in NY which unfortunately (and shockingly) ranked #1 for the Most Wrinkle-Prone States in America! Florida ranks 32. Thought it would be more. I'm in MI. It's #11. I'm in California ranked #36. I'm in Florida which ranks #32. I'm from Texas, and it ranks 38. I'm based in Cali which is ranked # 36- I expected it to rank higher! I live in Mississippi and it ranks #31. I felt like it would be fairly close to Georgia's rank. Thanks for this opportunity. I'm in SC and it's ranked 40th. We just moved from #22 - CT to #5 MA. I never knew this! One little drawback of moving to Boston. I'm in Pennsylvania.... YIKES!!! We are number two in the rankings!!! In Wisconsin, and we were #42! I'm in #11 Michigan. I find that odd that we are so high, I mean there is barely any sunshine here to cause any sun damage! So interesting! I'm in 42 Wisconsin. I'm sort-of surprised that we do so well. I suppose lack of sun damage, lol. I'm in California - No. 36 Sunny!